You are looking at the Circa computerized cutting table at work on the jigsaw of aluminum pieces that will shortly become FPB 64 number six. The production process is rolling at Circa, and there are some details to share including a short video. 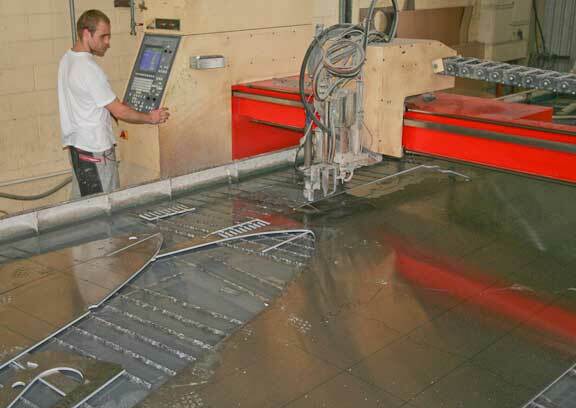 The computer controlled plasma cutter provides a high degree of accuracy, which translates to repeatability, and efficiency. 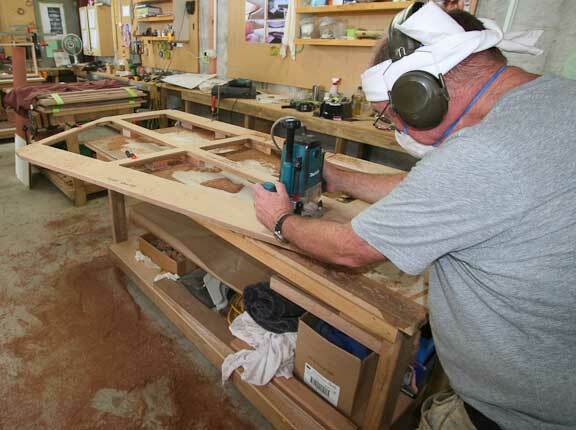 The cabinet makers can rely on the tboats being similar. 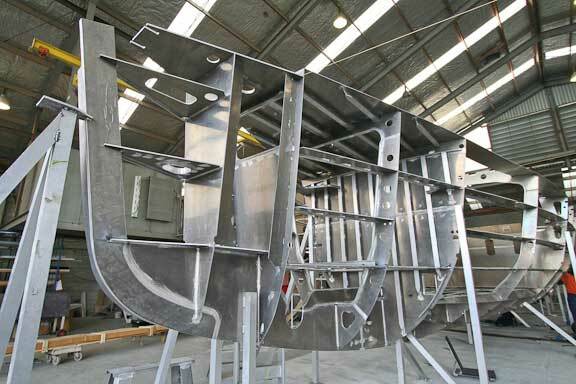 Tolerances are actually tighter than with production fiberglass yachts built with conventional resins. To watch a short video of the cutting table in action left click on the arrow above. Framing is coming along quickly on #5. Having recently put our stabilizer reinforcement to the test, we thought this photo of the bearing carrier insert and its structural web would be of interest. Then there is that hugely strong stem bar with its horizontal stiffeners. The area between the stem bar (bow) and the first frame is a sealed tank, for collision damage control. The top of the day tank in the engine room, with its plumbing, reed switch control assembly, and breather,. It makes a difficult piece of engineering look neat. While the fabricators are at work on the metal side of the factory, the “chippies” (carpenters) are moving right along as well. Those of you who have seen these boats in the flesh, or studied the interior photos, will know the high standard to which these men hold themselves. The most complex item in the interior is the fridge/freezer cabinet. The inner section is lined in stainless steel, then insulated with isocyanurate foam, wrapped in Mylar film, and sealed in a box, which you see here. The outer shell, which is the part in view, comes next. One could save a huge amount of money going with a conventional household system, but then that would change the power consumption dynamics in a fundamental way that would make us generator dependent, which we deem unpleasant. This entry was posted on Sunday, May 15th, 2011 at 9:20 pm and is filed under FPB 64 Updates. Both comments and pings are currently closed. A question on the stabilizer. I remember an older post where on Windhorse you ripped the bottom on a fin and commented on how little material and structural integrity. I understand that is the design to avoid stressing the post and creating much larger problems, but how does the weakness translate to the vision of the 64 supporting itself on its own bottom supported side to side by the stabilizers? NAIAD now confirms that the fin was defective and should not have sheared off at the insert. The fins are supposed to be tough enough to take some abuse and if they fail, first break away the bottom portion. Assuming a mud or sand bottom, in an intentional (slow) grounding, the loads on the fins are relatively low. I am surprised to see Circa using a Plasma table on aluminum. I may be misinformed, but I thought a Plasma cutter doesn’t make a clean enough cut in aluminum. The yard I work for gets all their parts water jet cut. Does Circa use a special kind of plasma cutter for work with aluminum? From much experience I can tell you their cutting table makes a nice cut. 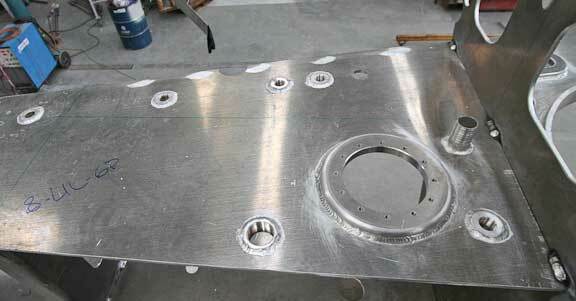 All the exposed edges are softened before assembly to reduce the cuts and nicks that come with working on a boat. What is your opinion about SeaKeeper Gyro systems? Too noisy? Take too long to come up to speed? I have followed the development of gyros for stabilization with interest. If you have no other option, they make sense. But with our booms and stabilizing fins we can develop the required stabilizing forces simply, and in a cost effective manner. It would be nice to get rid of the fins from a drag and risk standpoint, but the time between overhaul – 2000 hours the last I heard – and the cost of this process, makes the choice uneconomic. I have watched the FPB design development and exhaustive field testing for many years, intrigued from the first. There have been a few automobiles, sailing ships, and aeroplanes that might be said to have encompassed as comprehensive an array of computational skill, empirical diligence, practical good sense borne of actual experience, and sheer beauty. The selection of bare aluminum, for instance; the stuff in plain view toipsides has a beauty all its own in the eyes of many. But bare metal, and the ‘industrial’ quality of aluminum and countless pieces of engineered stainless elements gives a very different imporession to the mind under stress than, say, gelcoat and wood, or even steel hidden under lustrous paint. This ‘industrial toughness’ topsides has to lend a sense of security to all hands in a gale (all else being equal). I realize that wasn’t the reson you selected bare aluminum, but when the sea threatens to crush the will, that bare welded aluminum is as much *mental* as it is metal. Security, anywhere on earth’s oceans. The interior design is no less fascinating; the elegant simplicity of every interior detail. Form and proportion, all emanating from functional requirements; the wood finishes, the simple yet high-quality appointments. The interior reminds me of nothing so much as the work of the old Shaker communities where woodworking was a devotional work to God — brought into the computer age. The use of technology is laudable, too. State-of-the-art in every particular. Investing millions in what many would consider excess, the average multimillion-dollar vessel appears…well, *excessive*. The industry has improved in this respect; the average 20-year-old megayacht is truly a study in excess and horrible taste. But even today — as is true of architecture, automotive, and clothing design — very few designers and yards produce vessels that are truly exquisite without lapsing into gratuitous opulence. Then the siomple things, such as leaving all ER systems and elements open to view for regular inspection and maintenance. Only the experienced shorthanded blue-water cruiser knows how important such a simple thing is to life safety. 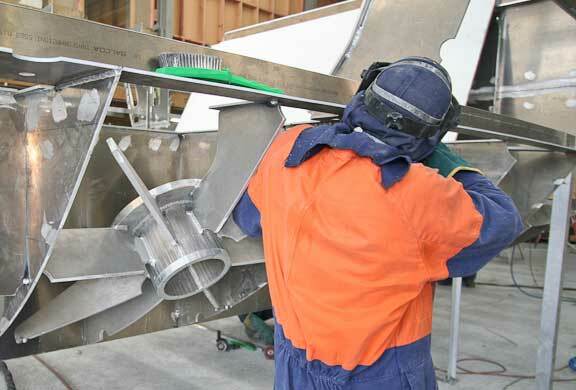 Many ‘cruising trawlers’ costing many multiples of the FPB series cost, display beautiful cowled-and-shuttered engine rooms with nary a component easily accessed for repair. I suppose many would say that’s what crew is for, but hiring a crew defeats the whole purpose of the cruising life, changing it into something else entirely. The FPB series: oceangoing oxymorons. Austere-elegant…futuristic-classic. That perfect balance that makes a human creation timeless is so rarely achieved; I think Herreshoff achieved it. Thank you (and all of those fellows in the yards you’ve worked with) for giving such pleasure to so many, simply knowing that something like perfection is still achievable at the hand of man. However, I would never consider us in the same class as the Wizard of Bristol. This is true; you’re in a different class, *now*. You’re designing and producing the quintessential power cruising vessels where Nat Herreshoff designed predominantly for sail. He produced some excellent (spartan?) engine designs, but the Herreshoff family’s offerings for power (military tubs) were only so-so. What you’re doing with the FPB series has never been done on the earth, period. A tiny niche, but still worthy of note for the value of each design refinement born of years of experience. Military shipyards have long produced vessels that can sail the high latitudes and even the ice pack (interesting prow on the 112 profile, BTW) but no civilian designer ever improved on such performance with a refined design for civilians. The FPB series is what it is. A power vessel matching the efficiency of a sailing cruiser of similar cabin volume? Some things are indeed better than others. As I said, human design rarely approaches purposeful perfection. Lest we think such dedication has gone out of the world, we do well to praise those in whom we find it. For those who seek to call the world’s oceans, islands, and ports their home (at least for a period of life) there is now a world standard. Your humility is laudable, but misplaced. Your decades of diligence and innovation are in our era the equal of Nat Herreshoff’s; simply in a different time. I’m sure many folk are as anxious to see your 112 take shape even as Wind Horse and the 64s have done. Thanks for showing moderns (of all cultures) that excellence is still a worthy pursuit in terms of function as well as beauty. For the Luddites among us, your design proves that technology may work beautifully in the background without marring beauty’s lines. Thanks you for the kind words. However, our attempts at creating the perfect cruising yacht (as illusive as that concept might be) are very much a team effort. Neither the FPB 83 nor the FPB 64 would have had their happy outcome if not for the labors of many different individuals and companies. 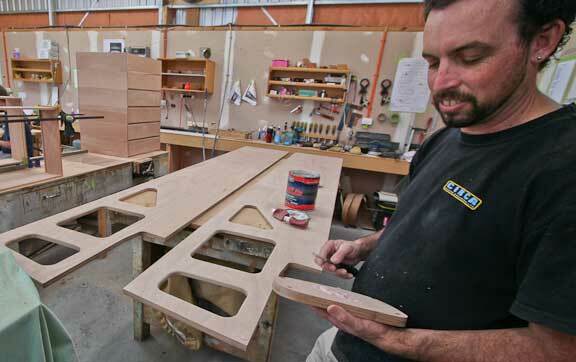 Starting from the concept stage, Steve Davis had a hand in the final look of the boats. The beautiful execution and systems would not have happened without Todd Rickard’s unceasing work (and innumerable long flights), or the efforts of Bruce Farrand and his team at Circa. And of course Kelly Archer had a hand in stirring this pot as did Dave DeVilliers on structural engineering and Ed Firth with detailing. The many vendors involved are too numerous to mention, but many contributed during design as well as execution phases. So your kudos, David, needs to be shared amongst the team. Understood, of course. No visionary puts flesh on the vision without the great ideas and hard work of others, and the best of them will always give due credit. The same could be said for the team in Bristol; one can’t consider ‘Reliance’ — that gargantuan sail…that masterpiece among sailing vessels and all her many groundbreaking feats of design and materials engineering — without knowing that Nathaniel Herreshoff was simply the mastermind. Many others made the thing happen as it did. Kudos to the whole team you’ve listed above; well deserved. FPB 64 Series Question #1: I presume there are good reasons for having so many different keypads and readouts at the main helm, rather than a more integrated ‘glass helm’; perhaps the redundancy offered by the former? To my untrained eye, Wind Horse’s helm appears to be the later generation in controls/annunciators/comm/etc than what I see in the manual for the FPB 64s. I can see the point in failure-proofing, so as not to lose all systems if a glass helm went down; I suppose even fully redundant black boxes and harnesses would still be chained to one electronic interface and annunciator and if the latter went down, you’re down. I’d wager that you’ve addressed this aspect of the FPB 64 design; can you steer me to the link for that/those post(s)? 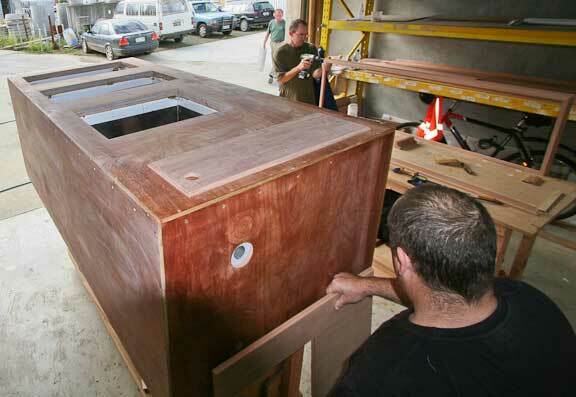 Question #2a: The platform/transom extension would seem to be the first option anyone would order, especially divers. If ordered early enough, will the stringers and hull plating simply be extended instead of bolting on an appendage? #2b: what is the diminishing-returns practical limit to the length of such an extension? Re your question on WInd Horse and the 64 controls, alarms, etc., Wind Horse has an analog system, with c olored LEDs and engraved plates to show what is happening. The 64 NMEA 2000 based system gives better information, particularly when under stress, The controls for windlass, lighting, day tank,etc. are essentially the same, except on Wind Horse these are mostly in the vertical face o f the desk. The swim step extension needs to bolt on, so it can be removed if there is a jurisdictional rule issue with being over 20 meters/65 feet. As far as where do the benefits start to diminish, in terms of efficiency you could add 20 feet/six meters and still benefit. But to maintain the correct motion characteristics what we’ve done is as far as is practical without creating negative consequences. Ah yes…all makes perfect sense, as I figured it would. 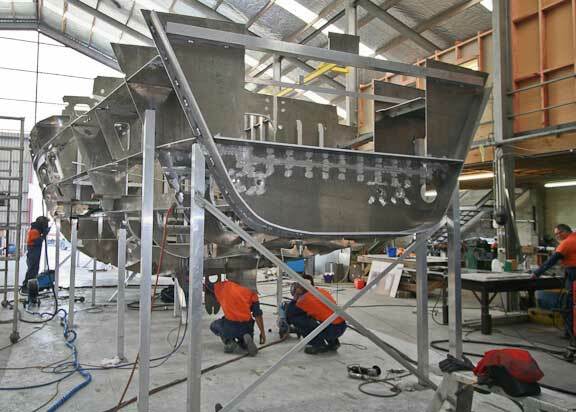 Okay, but is the swim step extension a ‘sealed’ vessel with a welded bulkhead, or just with a bolting flange at the mating surface, so the thing floods as it’s being unbolted and laid topsides? And I assume no one has actually tried this procedure on the Series 1 hulls with the extension, correct? The swim step extension has a flange at the interface, but it otherwise open. The intention is to do any mounting or removal while hauled out as there is a bit of work to do with sealants.